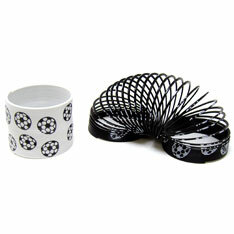 Precision cut springy white and black impact plastic accented with classic soccer ball designs. 3 inch. Sold by the dozen. Display boxed 12 count. $7.65 per dozen for 15 dozen or more. $6.80 per dozen for 30 dozen or more.